Every English teacher already knows what feedback is, but whether they can actually do the feedback that matches the material they teach. Sometimes, a lot of teachers cannot do good feedback on student assignments because they didn’t know how to do good feedback. They use inappropriate strategies in doing feedback in Oral work and written work. Therefore in this paper, the writer explains the kind of feedbacks, and strategies of doing feedback, and some example of feedback in Second Language Acquisition. Feedback in learning English is very important because feedback helps learners to improve specific points of learning, or to help plan their learning. 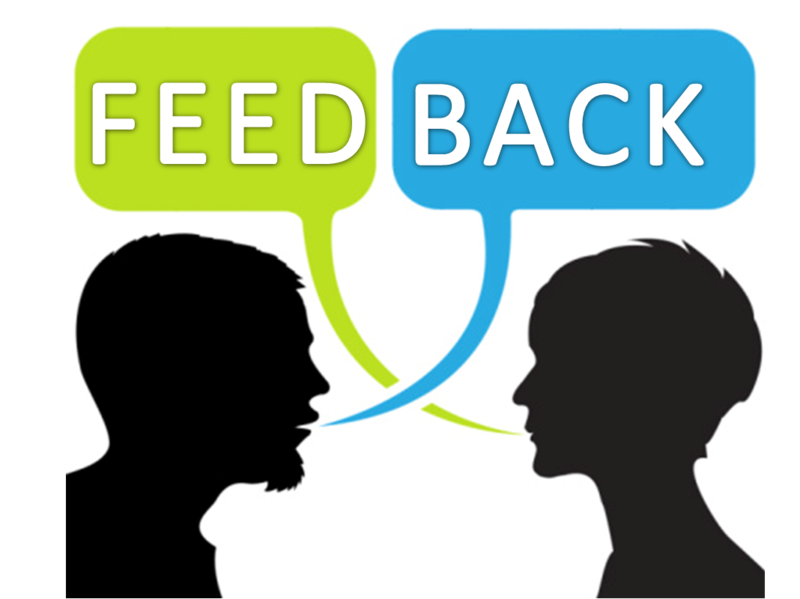 Feedback is information a teacher or another speaker, including another learner, gives to learners on how well they are doing, either to help the learner improve specific points, or to help plan their learning. Feedback can be immediate, during an activity, or delayed, at the end of an activity or part of a learning program and can take various forms. The efficiency of different types of feedback is determined by whether a technique results in uptake, and if does, by whether it results in successful repair. Thus, uptake refers to what the learners have attained from a particular lesson. Lyster and Ranta (1997) define uptake as “a student’s utterance that immediately follows the teacher’s feedback” (p. 49). In this framework, uptake comprises a reaction in some way to the teacher’s intention to draw the learner’s attention to some aspect of the student’s initial utterance. In this model, uptake is divided into uptake that results in repair of the error which was the focus of the feedback, an uptake that results in utterances that still need repair. Furthermore, some research (Ammar & Spada, 2006; Lyster, 1998). Feedback encompasses not only correcting students, but also offering them an assessment of how well they have done, whether during a drill or after a longer language production exercise. The way we assess and correct students will depend not only upon the kind of mistakes being made (and the reasons for them), but also on the type of activity the students are taking part in. Though feedback-both assessment and correction – can be very helpful during oral work teachers should not deal with all oral production in the same way. Decisions about how to react to performance will depend upon the stage of the lesson, the activity, the type of mistake, and the particular student who is making that mistake. A distinction is often made between accuracy and fluency. We need to decide whether a particular activity in the classroom is designed to expect the students’ complete accuracy – as in the study of a piece of grammar, a pronunciation exercise, or some vocabulary work for example – or whether we are asking the students to use the language as fluently as possible. We need to make a clear difference between “non-communicative” and “communicative” activities; whereas the former are generally intended to ensure correctness, The latter are designed to improve language fluency. Most students want and expect us to give them feedback on their performance. For Example, in one celebrated correspondence a non-native speaker teacher was upset when, on a teacher training course in Great Britain, her English trainers refused to correct any of her English because they thought it was inappropriate in a training situation. “We find that there is practically no correcting at all,” the teacher wrote, “and this comes to us a big disappointment” (Lavezzo and Dunford 1993;62). Her trainers were not guilty of neglect, however. There was a principle at stake: “The immediate and constant correction of the all errors in not necessarily an effective way of helping course participants improve their English the trainer replied on the same page of the journal. This exchange of views exemplifies current attitudes to correction and some of the uncertainties around it. The received view has been that when students are involved in accuracy work it is part of the teacher’s function to point out and correct the mistakes the students are making. We called this “teacher intervention” – a stage where the teacher stops the activity to make the correction. 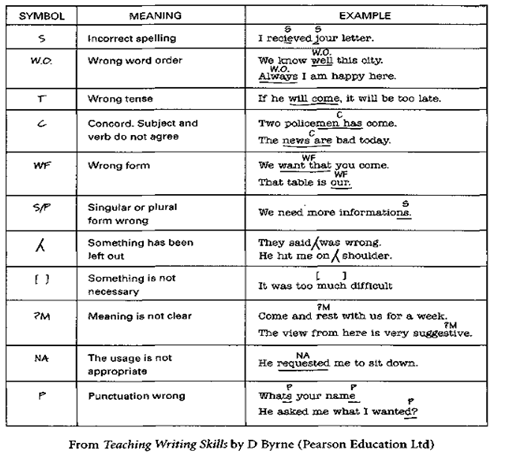 During communicative activities, however, it is generally felt that teachers should not interrupt students in mid-flow to point out a grammatical, lexical, or pronunciation error, since to do so interrupts the communication and drags an activity back to the study of language form or precise meaning. Indeed, according to one view of teaching and learning, speaking activities in the classroom, especially activities at the extreme communicative and of our continuum, act as a switch to help learners transfer “learnt” language to the “acquired” store (Ellis 1982) or a trigger, forcing students to think carefully about how best to express the meanings they wish to convey (Swain 1985: 249). Part of the value of such activities lies in the various attempts that students have to make to get their meanings across; processing language for communication is, in this view, the best way of processing language for acquisition. Teacher intervention in such circumstances can raise stress levels and stop the acquisition process in its tracks. If that is the case, the methodologist Tony Lynch argues, then students have a lot to gain from coming up against communication problems. Provided that they have some of the words and phrases necessary to help them negotiate a way out of their communicative impasses, they will learn a lot from so doing. When teacher intervene, not only to correct but also to supply alternative modes of expression to help students, they remove that need to negotiate meaning, and thus they may deny students a learning opportunity. In such situations teacher intervention may sometimes be necessary, but it is nevertheless unfortunate – even when we are using “gentle correction”. In Tony Lynch’s words, “…the best answer to the question of when to intervene in learner talk is; as late as possible” (Lynch 1997: 324). As Suggested at the beginning of this chapter, correction is usually made up of two distinct stages. In the first, teacher show students that a mistake has been made, and in the second, if necessary, they help the students to do something about it. The first set of techniques we need to be aware of then is devoted to showing incorrectness. These techniques are only really beneficial for what we are assuming to be language slips rather than embedded errors. The students are being expected to be able to correct themselves once the problem has been pointed out. If they cannot do this, however need to move on to alternative techniques. · Showing Incorrectness: this can be done in a number of different ways. 1. Repeating: here we can ask the student to repeat what they have said, perhaps by saying Again? Which, coupled with intonation and expression, will indicate that something is not clear. 2. Echoing: This can be a precise way of pin-pointing an error. We repeat what the student has said emphasizing the part of the utterance that was wrong, e.g. “Flight 309 GO to Paris? (said with a questioning intonation). It is an extremely efficient way of showing incorrectness during accuracy work. 3. Statement and Question: we can, of course, simply say That is not quite right, or Do people think that’s correct? To indicate that something has not quite worked. 4. Expression: when we know our classes well, a simple facial expression or a gesture (for example a wobbling hand), may be enough to indicate that something does not quite work. This needs to be done with care as the wrong expression or gesture can, in some circumstances, appear to be mocking or cruel. 5. Hinting: a quick way of helping students to activate rules they already know (but which they have temporarily “disobeyed”) is to give a quiet hint. We might just say the word “tense” to make them think that perhaps they should have used the past simple rather than the present perfect. We could say “countable” to make them think about a concord mistake they have made. This kind of hinting depends upon the students and the teacher sharing meta-language (linguistic terms) which, when whispered to students, will help them to correct themselves. Student: I would not have arrived late if I heard the alarm clock. Student: … if I had heard the alarm clock. In all procedures above, teachers hope that students will be able to correct themselves once the teacher has indicated that something was wrong. However, where students do not know or understand what the problem is because we are dealing with an error or an attempt that is beyond the students’ knowledge or capability, the teacher will want to help the students to get it right. · Setting it right: if the student is unable to correct herself, or respond to reformulation, we need to focus on the correct version in more detail. We can say the coreect version emphasizing the part where is a problem (e.g. Flight 309 GOES to Paris) before saying the sentence normally (e.g. Flight 309 goes to Paris), we can say the incorrect part correctly (e.g. Not”go”. Listen. “goes”). If necessary we can explain the grammar (e.g. We say “I go”, “We go”, but for “he”, “she” or “it” we say “goes”, for example “He goes to Paris”, or “Flight 309 goes to Paris”), or a lexical issue (e.g. We use “juvenile crime” when we talk about crime committed by children; a “childish crime” is an act that is silly because it’s like the sort of thing a child would do). We will then ask the student to repeat the utterance correctly. Sometime we ask students to correct each other. We might say Can anyone help Jarek/Krystyna? And hope that other students know the correct version of the utterance – after which the student who made the mistake should be able to say the sentence, question, or phrase accurately. Student to student correction works well in classes where there is a genuinely cooperative atmosphere; the idea of the group helping all of its members is a powerful concept. Nevertheless it can go horribly wrong where the error-making individual feels belittled by the process, thinking that they are the only one who does not know the grammar or vocabulary. We need to be exceptionally sensitive here, only encouraging the technique where it does not undermine such students. The way in which we respond to students when they speak in a fluency activity will have a significant bearing not only on how well they perform at the time but also on how they behave in fluency activities in the future. We need to respond to the content not just the language form; we need to be able to untangle problems which our students have encountered or are encountering, but these are thing we may well do after the event, not during it. Our tolerance of error in fluency sessions will be much greater than it is during more controlled sessions. Nevertheless, there are times when we may wish to intervene during fluency activities, just as there are ways we can respond to our students once activities are over. · Gentle correction: if communication breaks down completely during a fluency activity, we may well have to intervene. If our students cannot think of what to say, we may want to prompt them forwards. If this is just the right moment to points out a language feature we may offer a form of correction. Provided we other this help with tact and discreation there is no reason why such interventions should not be helpful. It is even possible that students can learn something new in this way when they are making an attempt at some language they are not quite sure of. · Recording mistakes: we frequently act as observers, watching and listening to students so what we can give feedback afterwards. Such observation allows us to give feedback to our students on how well they have performed, always remembering that we want to give positive as well as negative feedback. In each column we can note down things we heard, whether they are particularly good or especially incorrect or inappropriate. 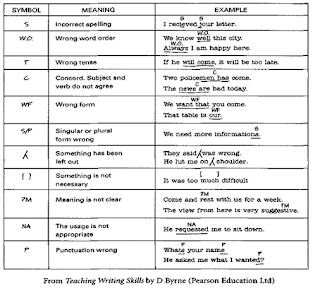 We might write down errors such as “according to my opinion” in the words and phrases column, or “I haven’t been yesterday” in the grammar column; we might record phoneme problems or stress issues in the pronunciation column and make a note of places where students disagreed too tentatively or bluntly in the appropriacy column. We can also record student’s language performance on audio or videotape. In this situation the students might be asked to design their own charts like the one above so that when they listen or watch they too will be recording more and less successful language performance in categories which make remembering what they heard easier. Another alternative is to divide students into groups and have each group watch listens for the use of appropriate or inappropriate phrases, while a third looks at the effect of the physical paralinguistic features that are used. If teachers want to involve students more – especially if they have been listening to audiotape or watching the video – they can ask them to write up any mistakes they think they heard on the board. This can lead to a discussion in which the class votes on whether they think the mistakes really are mistakes. Another possibility is for the teacher to transcribe parts of the recoding for future study. However, this takes up a lot of time! · After the event: when we have recorded student performance we will want to give feedback to the class. We can do this in a number of ways. We might want to give an assessment of an activity, saying how well we thought the students did in it, getting the students to tell us what they found easiest or most difficult. We can put some of the mistakes we have recorded up on the board and ask students firstly if they can recognize the problem, and then whether they can put it right. Or, as in the example above, we can write both correct and incorrect words, phrases, or sentences on the board and have the students decide which is which. When we write examples of what we heard on the board, it is not generally a good idea to say who made the mistakes since this may expose them in front of their classmates. Indeed, we will probably want to concentrate most on those mistakes which were made by more than one person. These can then lead on to quick teaching and re-teaching sequences which arrive opportunistically in this way. Another possibility is for teacher to write individual notes to students, recording mistakes they heard from those particular students with suggestions about where they might look for information about the language – in dictionaries, grammar books, or on the Internet. The way we give feedback on writing will depend on the kind of writing task the students have undertaken, and the effect we wish to create. When students do workbook exercises based on controlled testing activities, we will mark their efforts right or wrong possibly penciling in the correct answer for them to study. However, when we give feedback on more creative or communicative writing (such as letters, reports, stories, or poems) we will approach the task with circumspection and clearly demonstrate our interest in the content of the students’ work. · Responding: one way of considering feedback is to think of it as “responding” to students work rather than assessing or evaluating what they have done. When we respond, we say how the text appears to us and how successful we think it has been – and, sometimes, how it could be improved. Such responses are vital at various stages of the writing process cycle. Thus students may show us a first draft of their work; our response will be to say how it is progressing and how we think they might improve it in subsequent drafts. The comments we offer them need to appear helpful and not censorious. Sometimes they will be in the margin of the student’s work (or, on a computer, written as vieable “comment”), or if more extensive may need a separate piece of paper – or separate computer document. Knowing strategies of feedback in learning English is very important because it helps teachers to know what exactly student need in learning English. Teachers gives to learners on how well they are doing, either to help the learner improve specific points, or to help plan their learning. Feedback can be immediate, during an activity, or delayed, at the end of an activity or part of a learning program and can take various forms. Harmer, Jeremy. 2001. The Practice of English Language Teaching, 3rd Edition. USA: Longman Press. Lyster, R. 1998. Recasts, repetition, and ambiguity in L2 classroom discourse. Studies in Second Language Acquisition, 20, 51-81. Nunan, D. (2005). Classroom research. In E. Hinkel (Ed.) Handbook of research in second language teaching and learning , 225-240. Mahwah, NJ: Lawrence Erlbaum. Do you really think this advices would be helpful for young writers? I will try this out , but I think it's not a guarantee of success! But will see it! Very informative post. You can find and order research paper about marijuana from our service.